← New Campaign: Mummy Rustlers! First Session (19 page pdf) “Posse Up” – Our collection of oddballs gets its first mission and gets to make friends and enemies with the other teams. Then it’s into the ruins to delve the depths of the past for loot! I mentioned our new Dungeon World rules, Paizo AP campaign last time. I’ve started the usual campaign page to hold our info, it’ll flesh out as we go. The first session was really fun and we got a lot done! Since DW is all quick and easy, we did collaborative character creation during the session. We had poked around and had ideas of classes we wanted to play. Step one was pick race, we were all human except Tim who picked an ifrit. Paul came up with some ability for him (immune to nonmagical fire, I think, I need to get pics of everyone’s sheets). Then we assigned stats and picked starting moves, all of which takes 5 minutes max. Then we went around to develop our backstories and set bonds with the other players. Paul just asked player 1 (Patrick in this case) some details about his character Usif. Paul: What do you look like? Patrick: Well, I have burn scars and a hoarse voice from the initiation to my immolator group. Paul: Is that a religious or wizardly group? Patrick: Well, both really, not strongly either… Me: So like an Esoteric Order of the Golden Dawn kind of thing. Others chime in as we talk through Usif. I’m the local Golarion expert and I pop open pathfinderwiki.com to add details. Who’s the elemental prince of fire that his immolator cult can be into? It’s Ymeri, Queen of the Inferno. Why is he tomb raiding? He hopes to find an elemental gem important to his and other rival fire cults in the tombs. Then to the next person, and as we develop the backstories we pick bonds to each other. Usif hired me to join the team because of my trap skills. He knows Denat the ifrit because Denat wants to use his immolator fire in his cooking rituals. And so on. We then did this with each character in turn. Murdus believes he’s the reincarnation of a dead pharaoh after having anexperience in the desert Moon Knight style. Which one? I hit the wiki again and we find Hetshepsu the Fiend Pharaoh that matches the parameters he’s looking for. So with a combination of player thoughts, GM question prompts, help from the other players, and Golarion/Osirion/Wati background info we all get fully fleshed out, interwoven backgrounds deeply tied to the AP in about an hour. Then Paul kicks us off with a fight! We’re going to the drawing/briefing for all us new tomb raiders and Murdus’ crazy sister (who also thinks she’s the reincarnation of a pharaoh and means they’re at each others’ throats) shows up with her gang of ice lizards and boy toys to get our drawing token. We fight them off, but when we realize the ice lizards, instead of being vulnerable to fire, actually absorb and eat fire, it’s a setback for our fire-themed party members. I dart his sister’s token out of her fingers and we almost get it too but unfortunately we lose it in the end, but retain ours and most of our body parts. Then we go to the gathering and meet a half dozen other groups! My (Khaled’s) philosophy is that these guys aren’t our enemies or competition… Our sites are regulated by the priests, and we might need each others’ help from time to time (like European explorers in Africa), so he went around trying to make friends. We immediately hit it off with the Dog Soldiers, some halflings with beer kegs on their dogs. We have a chef so we put together a tailgate party. The rest don’t seem friendly so he goes to the group with a Taldan noblewoman in a big purple hat and chats her up. She’s resistant at first but Khaled convinces them to join them for dinner, doing his best Aladdin-the prince-in-rogue’s-clothing impression. We have dinner with them and Khaled puts on the full court press. Their cleric is clearly taken with our ifrit, which is good for us. Our ifrit is ambivalent but sometimes you have to take one for the team. Then we hit our tomb! We thwart both traps and vermin (and make a side trip to screw with Murdus’ sister; she makes a side trip to screw with us too). 19 pages of session summary – chargen, combat, adventure setup, multiple group interaction, and about half of a dungeon crawl with a bunch of fights all in one session. An amazing amount of fun, with a lot of the rules taken out! And we level. More next time! 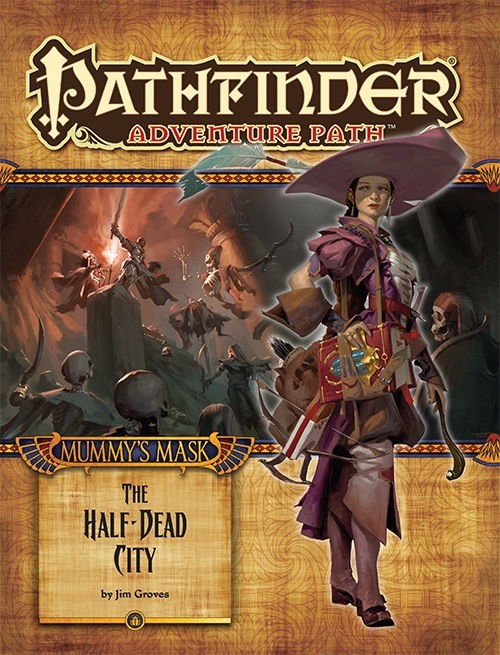 This entry was posted in session summaries and tagged actual play, adventure path, dungeon world, mummy's mask, session summary, story hour. Bookmark the permalink. Was that a normal length session? You got so much done! Seriously though – it sounded like…a normal session. That’s encouraging, I’d love to get my group into a more rules-light system. A little longer than normal but not by much. Just faster!